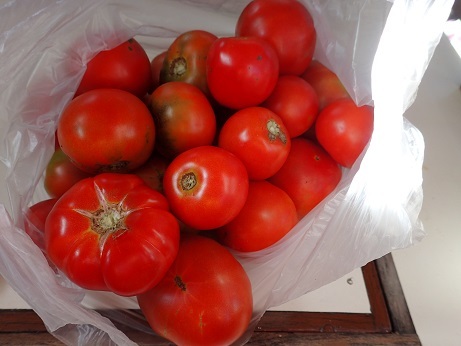 Galley Wench Tales: Best Danged Tomatoes – In Maupiti?!? Best Danged Tomatoes – In Maupiti?!? tasted even better than they looked – a tall order! ‘Twas with envious eyes I viewed two bulging bags of tomatoes at the most beautiful site ever for a Mobil station with an upside down sign in Maupiti. I considered asking the local who’d purchased those snappy tomatoes if she’d consider selling me some, but chickened out. Will you get more tomatoes tomorrow? I asked the gas station proprietor. She didn’t know. In Bora Bora I reluctantly paid about $3.50/pound for the three unbruised pale pink tomatoes I saw. They went from pink to rotten in two days, bypassing the ripe stage. Dispiritedly I chucked them overboard. Two days later David from Anahata offered a dinghy ride to the bakery by the Mobil station. He was looking for baked goods (53 cents for a price controlled meter-long fresh-baked baguette), I was hopeful for tomatoes. For $6 I purchased a good sized bag of succulent tomatoes. I was ecstatic. They were the best I’d seen since the Mexican produce store in the farming community of Stuart Florida seven months prior! That afternoon I sliced several of the beauties, topping them with goat cheese feta, a sprinkling of herbes du Provence and a touch of olive oil. Ambrosia! As was the one I ate just plain, like an apple, but as juicy as a fresh-picked dead-ripe peach. Funny, while the “big city” box stores like Carrefour aregreat for restocking on items like dry salami and hooch, my most flavorsome fresh food finds seem to appear where I’d least expect them, in little backwater spots, like Maupiti’s Mobil station, roasted chicken from the unincorporated area outside Panama City next to thepropane facility, shish kebabs over a bicycle BBQ brazier in Bocas del Toro, pamplemousse pilfered from a sacred tiki site in Hiva Oa, a chocolate-filledéclair at the last supermarket in Atuona…. When I see these luscious little wonders, I’ve learned to trust my instincts and indulge. If you’re in line behind me and there’s only one bag of succulent tomatoes left – sorry, though I might be willing to share a few if you ask. Suwarrow - our next stop. Image pilfered from Yachtpals.com. Written in Maupiti, our last stop in French Polynesia (S16.26.838 W152.14.690) and set to post while we’re underway on an 1,100+ mile passage to Pago Pago, American Samoa. We hope to stop for some R&R at Suwarrow in the Cook Islands along the way, though we expect no wifi in that remote location.